The southwest corner of Maxwell Street at Halsted was once occupied by a large, polychrome Art Deco building designed by Carl Hauber for B. Weinstein in 1929. The glazed terra cotta-clad commercial building formerly at 1328-38 S. Halsted / 801-03 W. Maxwell was coded orange in the city’s Historic Resources Survey as having been significant in the context of its community. (The Survey mis-spells his name as Carl Hamber, FYI). 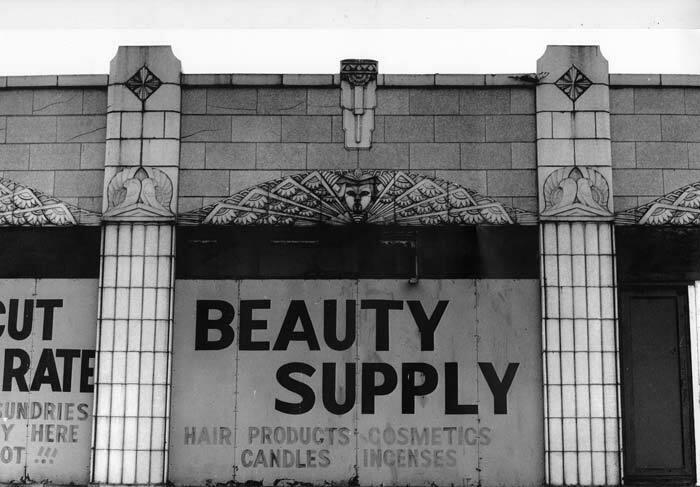 The building had six bays on the Halsted Street side and three bays on the Maxwell Street side accomodating the need for multiple storefronts on this busy intersection at the hub of the historic Maxwell Street Market. Members of the Maxwell Street Foundation salvaged the second-story terra cotta panels with fan-shaped ornaments of a female face, surrounded by a repeating sunburst. Hauber was a member of the firm Ronneberg, Pierce, and Hauber before opening his own office in Chicago’s Kimball building at 25 E. Jackson in 1923. Library records at the ARt Iinstitute of Chicago show that His wife (Mrs. Carl Hauber) was an annual member of the AIC in 1924. All images published by the Maxwell Street Foundation within this website are copyright of the artist and are for educational, personal, and/or noncommercial use only. For any other use, please contact gro.n1555620707oitad1555620707nuoft1555620707eerts1555620707llewx1555620707am@of1555620707ni1555620707.